It’s Spring and I’m making coats for next fall/winter. Truth be told, it’s still cold in the Midwest. Spring may not arrive until mid April. Don’t let the sun fool you. Today I took these photos, it was about 40 degrees, with a chilly crisp wind. So this coat is for right now. I’m batting a 100 with my selecting fabrics from Mood. I’ve had nothing but success and happiness when I select a textiles and other goodies from Mood. My coat is made of Mood’s Infinity Black and Multi-Color Gray/Black Abstract. I purchased this about two years ago, but was undecided about what kind of coat to make. I chose this fabric because of it’s unique texture and weave. I love combining classic styles with interesting fabrics. This one has a lot of body. It’s a looser ropy weave with a slightly rough hand. When cut, it unravels like a jacquard. So you need to finish the edges or sew it up quick. It presses easy and is easy to mold into shape. 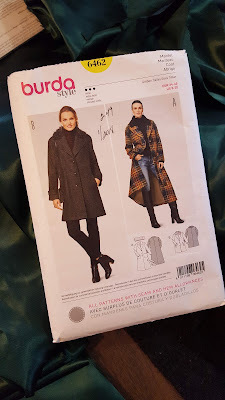 If you are so inspired to make a coat, here is a link to some gorgeousness. The upper collar of my coat is Mood’s Faux Black Bear Fur (#312623). Sorry it’s no longer in stock. But come fall you may be able to see it again at the online store. It’s thick, soft and shiny. It feels wonderful against my skin. Here is a link to a variety of Faux Fur. There is so many styles and choices to choose from. To cut the faux fur, I used a single edge razor blade instead of scissors. First, I started by trace the pattern onto the wrong side of the fur with tailor chalk. Then I used the razor to cut out the upper collar. This method reduces the amount of cut fur. After sewing the upper and under collars together, I used a straight pin to pick out the fur caught in the stitches. The lining is Canary/Rose iridescent twill lining. (#FN26445). You can’t go wrong with Mood’s twill lining. I order it all the time to line coats, dresses, skirts. You name it. This is the second coat that I made using Burda Style 6462. You can find some of the basic pattern details here on my blog. This pattern is perfect for that desired boyfriend coat that you’ve been wanting to make. One of the things that drew me to this pattern was the welt pockets and another opportunity to practice making them. For the buttonholes, I did two applications per buttonhole to help reduce the chance of fraying. Then I generously applied Fray Check allowing it to dry over night before cutting the buttonholes open. It worked like a charm. Border Print Maxi Skirt: with shine! Stretch cotton border print set!